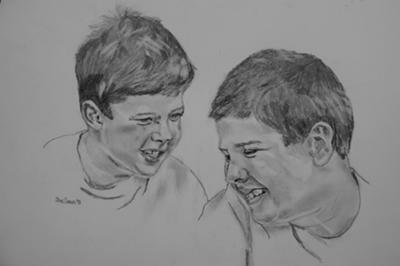 I picked my two favorite pictures of my boys and combined them in one drawing. I used Faber-Castell graphite pencil set (2H,HB,B,2B,4B,6B) that I had gotten for a drawing session a couple of years ago on 146 lb. Bristol Board. I was somewhat pleased since I have not done a sketch in years, but I will definitely be trying this again, maybe with some charcoal thrown in. The photograph of the drawing appears somewhat rougher than the original. When I photogaphed it, it appeared browned due to lighting. I attempted to repair this with Picasa 3 to get it back to its original colors. It did improve it a great deal but roughened the sketch some. Doug's Note: Very nice work, particularly since you haven't done a sketch for so long. To me, the most important thing in drawing lifelike pencil portraits is to capture realism and expression ... you've done both. You've obviously paid attention to the highlights in the hair, in each drawing.